The LEGO Dimensions Wave 4 packs have officially landed in stores today and include: The Midway Arcade Level Pack, including a buildable Gamer Kid minifigure and G-6155 Spy Hunter vehicle and Arcade Machine – all playable in the game, and unlocks more than 20 classic arcade games from Midway Arcade as an exclusive level; The Ghostbusers Fun Pack, including the Stay Puft Marshmallow Man and Terror Dog; The DC Comics Fun Pack, which features Superman and a Hover Pod; and another DC Comics Fun pack, including Aquaman and an Aqua Watercraft! Check out the trailer for the level pack and new content TV Spot below! LEGO Dimensions is an entertainment experience that merges physical brick building with interactive console gameplay, and includes gameplay from “The Simpsons,” “Doctor Who,” Portal, Jurassic World, Midway Arcade, LEGO Chima and “Scooby-Doo!” These fan-favorite worlds, most of which have never before been in a LEGO video game, will converge with DC Comics, The Lord of the Rings, The LEGO Movie, The Wizard of Oz, LEGO Ninjago and Back to the Future worlds in one thrilling adventure playable with the LEGO Dimensions Starter Pack. 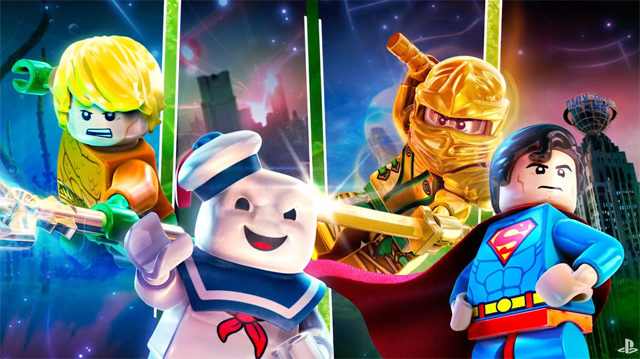 LEGO Dimensions is available for the Xbox One, Xbox 360, PlayStation 4, PlayStation 3 and Nintendo Wii U.